Where will you trade up or purchase your vacation or investment property? There are no crystal balls to guide you to the next real estate boom town. But a glimpse at a few burgeoning locales might prove vital. Long Island. It began as a bedroom community for countless family folks who wanted a quick commute to Manhattan, and plenty of bucolic green space to enjoy during their time off, while most younger people preferred to make their homes directly in one of the world’s most famous cities. But times have changed. With over 400 miles of beach coastline, ample state and amusement parks, stunning nature preserves, performing arts and cultural centers, nightclubs and thousands of multicultural restaurants, Long Island has emerged as a formidable cultural and social center in its own right. A growing number of young professionals have migrated here over the past couple of decades, bringing with them the commodities of living in Manhattan and, in effect, enjoying the best of both worlds. Homebuyers are also moving from western portions of the Island to the east, Pitlake says. Dr. Pearl Kamer, chief economist for the Long Island Association, agrees. “Ten years ago, the town of Huntington was attracting plenty of homebuyers,” she notes. “And, while there’s still affordable housing being built there, I’d say that now, the up and coming neighborhoods are from Brookhaven on east. The effort included the refurbishing of the Patchogue Theatre for the Performing Arts, which dates back to the 1920s, Dr. Kamer says. This mixed-use venue offers a variety of events including live performances, films, educational presentations, commercial productions, community forums and other appropriate events. With a seating capacity of 1,200, it is Suffolk County’s largest such multi-use theater. “New Village” is another affordable housing project planned in Patchogue as part of the revitalization. While final plans are not set, it would replace the former Swezey’s department store and could include 240 rental units, 20,000 square feet of new retail space and a 106-room hotel. Additionally, two new housing developments—Copper Beech Village with 80 townhouse units, and Bay Village Condominiums—were also built in Patchogue over the last few years and are at or near full capacity, according to Ed Shine, a licensed sales agent for Prudential Douglas Elliman Real Estate in Medford who lives in Patchogue. These are not part of the affordable housing revitalization effort, he stresses, but are attracting buyers nonetheless. “The taxes in Patchogue are pretty low and the home prices are affordable compared to the rest of Long Island,” Shine says. Some waterfront homes on the Great South Bay can be had for around $499,000, he says. Patchogue is also a transportation hub—close to Long Island Railroad and all the major highways. The Patchogue River, home to plenty of yachts and smaller sailing vessels provides ferry service to Fire Island. And, McArthur Airport is just minutes away. But, the Island’s recreational and residential claim to fame is still the Hamptons. The growing roster of A-list celebrities who live there at least part of the year—people from Stephen Spielberg and Jerry Seinfeld to Sean Combs and Jon Bon Jovi—speaks for itself. The area’s foremost attraction is its fabulous ocean beaches, including Main Beach in East Hampton—which consistently ranks among the nation’s top 10 by beach expert Stephen Leatherman—a.k.a. “Dr. Beach” of Florida International University. There are also many picturesque places to keep a boat—or visit in one—such as Three Mile Harbor. And, keeping residents entertained at night is a vast array of top-notch restaurants and nightclubs that give Manhattan nightlife a run for its money. Still, living in the Hamptons is financially prohibitive to many people, let alone considering it as ideal for a second or vacation home. Which is likely why towns like Riverhead—dubbed a “gateway town” to the Hamptons—is experiencing tremendous growth. It offers close proximity to the playground of the rich and famous at substantially lower prices. “What’s happening here is just amazing” says Tom Spanzino, 46, a lifelong Riverhead resident. In addition to the development of the Tanger Outlet Center with more than 165 discounted brand-name shops, Atlantis Marine World, the Dinosaur Walk Museum and the Vail-Leavitt Music Hall, the area has seen an increase in restaurants, boutiques and entertainment venues, he says. The recently constructed Riverhead Centre on Route 58 houses a host of retailers including Pier 1 Imports, Linens ‘n Things and Best Buy. Plans have been submitted to build a hotel along the Peconic River. The northern boundary of Riverhead has ample space for new home development, says Valerie Goode, a former Riverhead resident and owner of Colony Realty in Jamesport. “And that’s what’s been happening—in spurts,” she says. Nearing completion is a model home for a ten-home development on Honey Lane, where new 3 bedroom homes will be built on one-acre plots and priced from $389,000 and up, she says. New communities for people 55 and older include Saddle Lakes and Sunken Pond Estates, both on Middle Country Road. Saddle Lakes features 196 units of 2- to 3-bedroom ranches and two-story homes, priced from $300,000 to $400,000. Sunken Pond Estates has 108 units occupied; the final 84 are under construction, with 76 sold. Prices range from $310,000 to $350,000, according Whitewood Landing LLC of Riverhead, the developer of the properties. 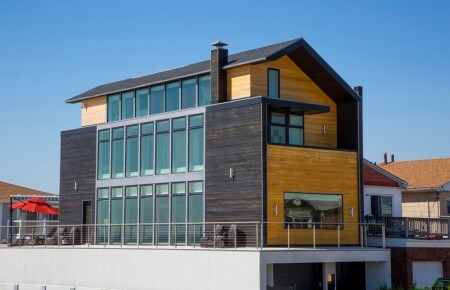 While living on Long Island’s waterfront can easily set you back several million dollars, there are some exceptions. 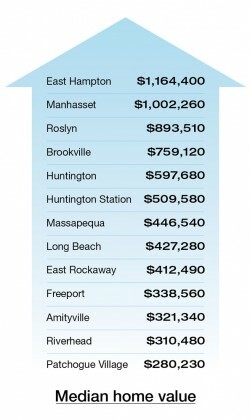 Several communities offer waterfront homes for $500,000 or less, according to data from the Multiple Listing Service of Long Island (MLSLI), a network of more than 2,400 real estate offices located throughout Nassau, Suffolk and Queens Counties. With its newly-refurbished Nautical Mile that offers a plethora of seafood restaurants, specialty shops, charter fishing and serene views—all in walking distance of one another—Freeport on the south shore sits on several canals and inlets with waterfront homes at a median price of $535,000, according to the MLSLI. “It’s a very popular and affordable place for young people and families to buy,” Pitlake says. The area is also ethnically diverse, has a variety of charter boat options and is a 44-minute commute to Manhattan, she says. The Village of East Rockaway on Hewlett Bay provides quiet, tree-lined streets with older homes of charm and character. Waterfront houses have a median sales price of $449,000, according to the Multiple Listing Service. And commutes to the city can be as short as 38 minutes on the Long Island Railroad. Mayor Peter Imbert of Amityville has helped turn this quaint community—known for its turn-of-the-century Victorian homes as well as beaches, parks, and fishing areas—into a more vibrant area. With the help of New York State Sen. Owen H. Johnson, in late 2008, he secured a $500,000 state grant (the largest such grant ever received by Amityville) to help fund the Amityville Village Beach Waterfront Revitalization project. The planned project will include renovation to the beach pavilion, playground, walkway and parking improvements, a spray park with water fountains and an upgraded restaurant and concession stand. 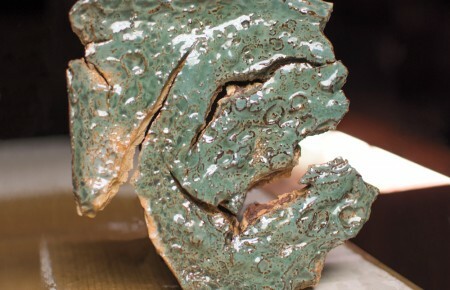 However, additional funding is still being sought for this project. Other revitalization efforts include the fairly new Nautical Park on Merrick Road and Ocean Avenue. Though it still awaits a gazebo and senior center, it is giving the downtown area a fresh new look. A measure was recently passed to relocate village hall, the court and police station into a new, energy efficient building on Ireland Place. Nancy Fraser, a licensed broker associate with Exit Realty Premier in Massapequa Park, is also a long-time Amityville resident. Over the last several years, she says, owners of the town’s many 100-plus-year-old Victorian homes have been refurbishing them. “Amityville is known for these homes; they are truly magnificent,” she says. And, while prices have subsequently gone up, recent housing market turmoil has brought them down again, making them more affordable, she says. You can still find waterfront dwellings on the Great South Bay for a median price tag of $499,495, the MLSLI reports. 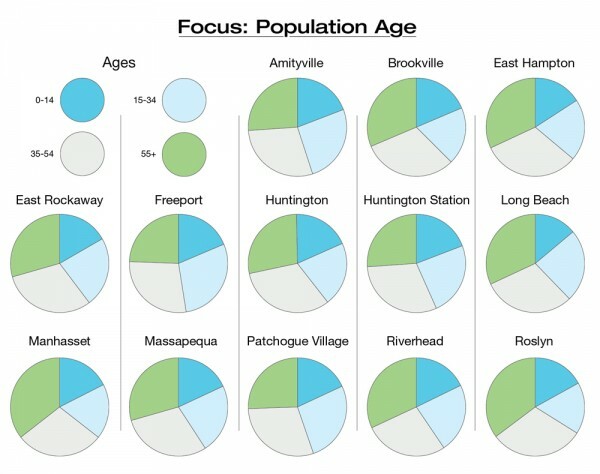 So, where are young families moving on Long Island these days? The right neighborhood has to have good schools, but affordable taxes. It has to have the right balance of community fare, including playgrounds, soccer or Little League and religious institutions. “Transportation is important, so that mom or dad can get to jobs quickly without sacrificing too much time away,” says Pitlake. And while downtown areas are nice, they’re not necessities to those who like the privacy of single-family-home living. 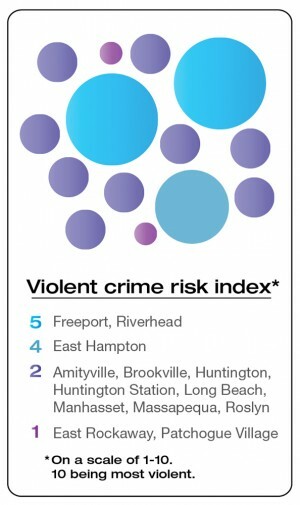 Massapequa and Huntington Station are being cited as “hot spots” for families with young children to live, to name but two.